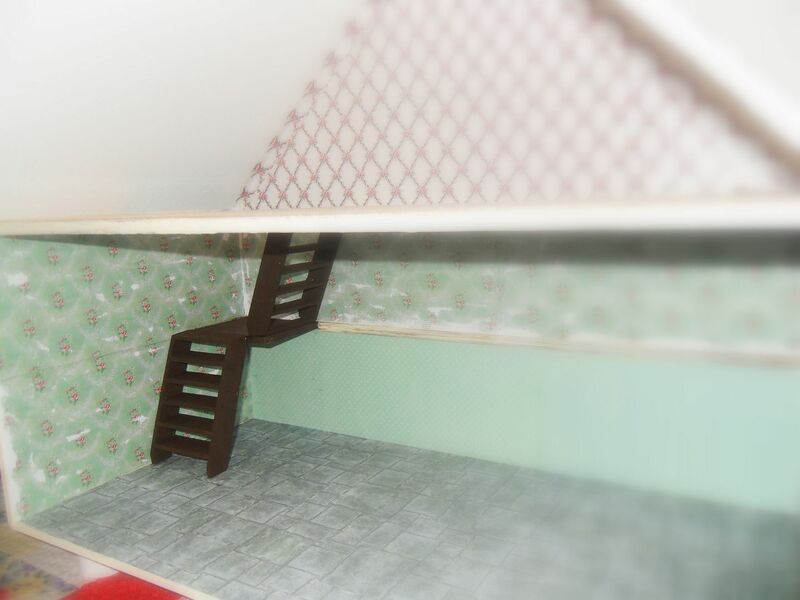 The Doll's House: Putting it together . . . Putting it together . . . There is something very satisfying about building something yourself with your very own two hands . . . Back in the 1990's my ex husband, our children and myself built our own house on some reclaimed swamp land in a rural area of New Brunswick in Canada. When it was done that house meant the world to us . . . and I am sure the main reason was because we had put so much personal effort into it. 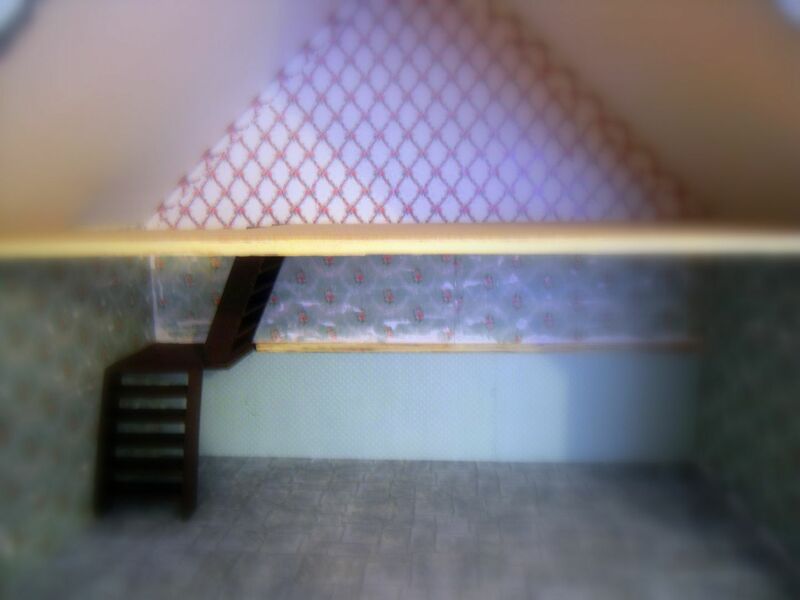 Over the past few weeks I have taken over the kitchen table as I put together my doll's house. The top has been scattered with glue and paint and scraps of paper. There were times when I thought it would never come together . . . times when I wanted to throw it out the window! I persevered though, and, with a tiny bit of help from Todd at the end (helping me to hold things together so that I could strap them tightly so that the glue could set), this is what I ended up with. A lovely little house, I think. I used weathered brick papers for the outside, along with slate roof tiled paper for the roof. 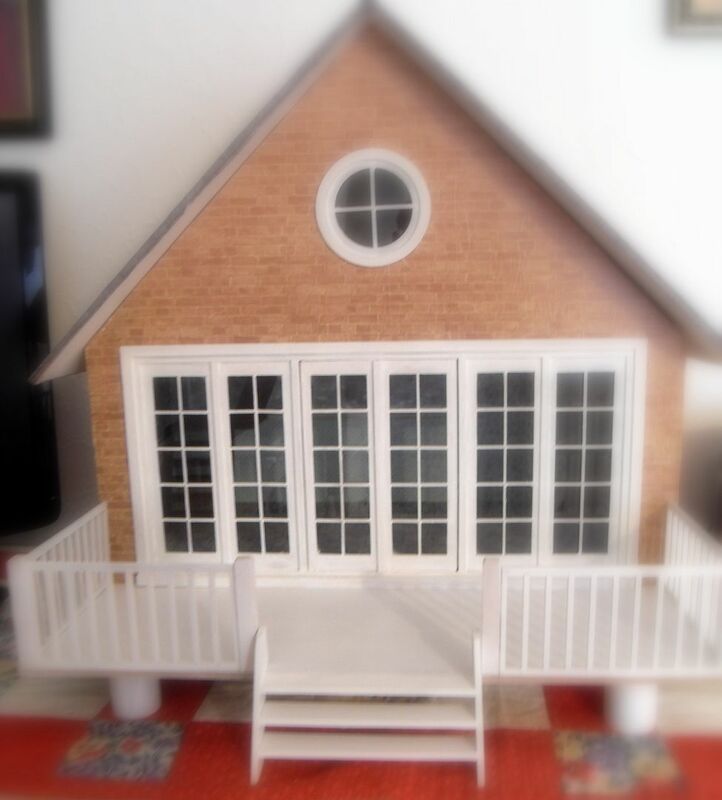 I had bought some wooden gingerbread trim to paint white and apply on the edges of the roof, but it just didn't work out, and so I had to abandon that idea . . . perhaps in time I can figure out a way to make it work. I love the white Veranda . . . I know it is supposed to be a deck, but to me it is a Veranda . . . I have always cherished the idea of having my very own Veranda . . . a place where I could sit in the summer months and watch the neighbourhood go by . . . calling out cheerful greetings to friends and neighbours as they pass . . . listening to the birds sing and the bumblebees hum . . .
You can see it is very small inside, only two rooms really . . . but big enough for a start and I know I will have fun with it. I used a Cotswold Stone paper for the flooring in the kitchen and upstairs has mushroom coloured wall to wall carpeting. At first I had painted the downstairs wall halfway up in a cream colour and decorated it with lines to look like paneling with a chair rail dividing the top of the wall from the bottom, the top being decorated in a Blue and White Dutch tile paper . . . but I didn't really like the way it turned out and then I remembered . . . I had some beautiful Magnolia Scrap Book Papers, called Grandmother's wall paper and so I used that instead. I love the aged, shabby chic look it gave to the kitchen area . . . just perfect I thought! I had another plain paper which matched well in colour and so that is what I used for the bottom of the wall. Upstairs is a pretty pink rose trellis wall paper that I found in Hobby Craft. I used textured white scrapbook papers to line the ceilings, which don't show up in pictures. But they do look really lovely. You'll just have to take my word for it. So now the house is ready to move into . . . I wonder what will happen next? even though it all fits together on the dry run, that doesn't mean that it will fit together when you go to glue it together permanently. Be prepared to jimmy and scrape. Strapping, strapping, strapping. Using masking tape doesn't quite cut it. I didn't find it strong enough so had Todd standing there holding things together while I ran around the house looking for something sturdy enough to tie it together without leaving any marks. I finally settled on ribbons, which thankfully I had in abundance! 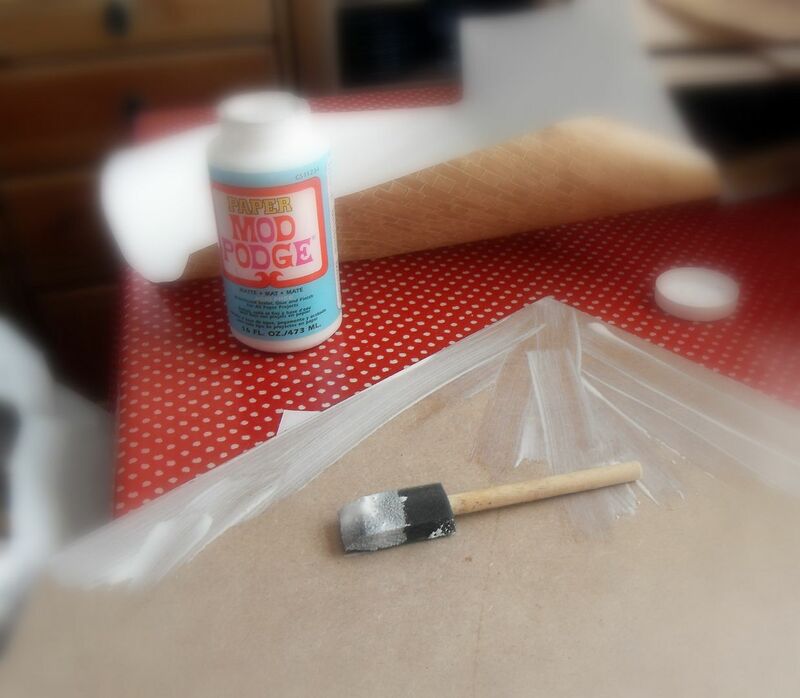 foam rubber brushes work wonderfully for spreading glue and paint in large quantities, just make sure you don't use the same ones for both and rinse them out really well after use. 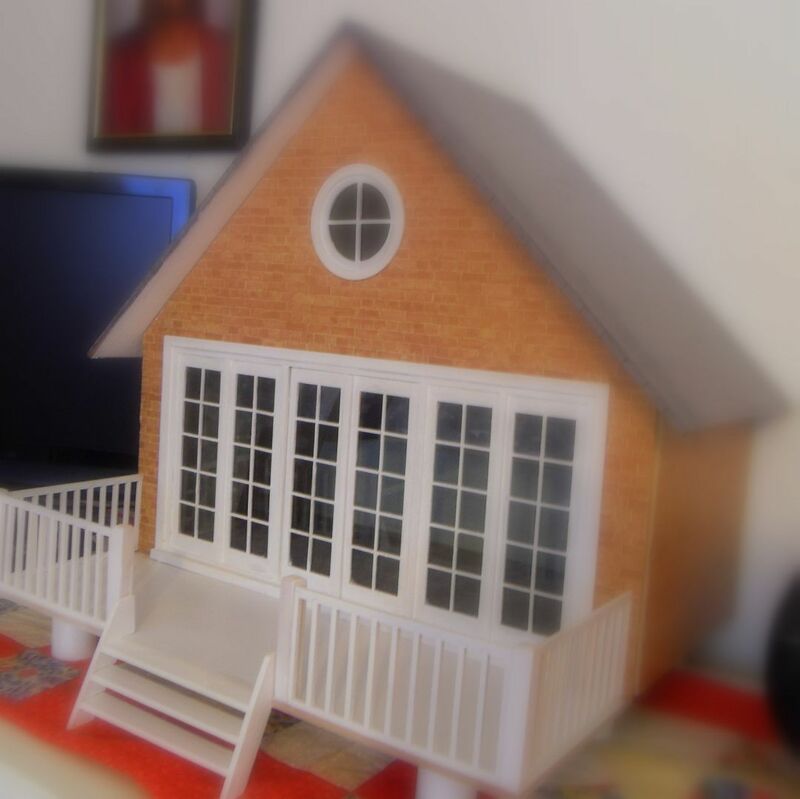 I had to use Mozilla but I'm here..love your Doll House!!! Looks great, Marie- how fun!! I love this Marie!! I am excited to watch as your beautiful little house progresses!! The house looks very loved already:) I can't wait to see who moves in. One cold and windy night . . .